The Thursday just gone was an inset day (due to the teachers being on strike), so I decided I'd prefer an insect day! I had to go to my grandma's and boy did I have some success!!! My grandma and grandpa had taken me to a local reservoir; I was hoping I would see the Common Sandpiper and I did. I managed to get a few good snaps before it went to join it's parent on the shingle shore. I think I will enter one of the photos into the Country File photographic competition. Hares are quick and fascinating wonders to nature (possibly my new favorite type of animal apart from birds). The last time I visited Brenig there were quite a few pairs of Greylag Geese about, and so when I went this time I found that they had bred; I watched at least 50 of them. And of course I couldn't forget the bird that caused all the commotion on Twitter the Black/Common Redstart. The final conclusion was a Common Redstart. And the insects, well I think my brother Harley will be blogging about them some time soon. Tonight's question is an ID one. I will post the answer on Thursday night as I am going away to Grandma's tomorrow for a night, as school are on strike. I'll be looking for the fledged Pied Flycatchers. I should have cropped it a bit closer to make it trickier. Well done everyone that got it right. A while back I blogged about going to my Grandma's, however I missed out a blog so I thought I'd share it with you today. A nice day on Thursday gave me chance to watch a rather big Tern colony at Cemlyn Bay. Below is my best Sandwich Tern flight shot; these are my favorite of the terns in the UK. It wasn't just Sandwich Terns I saw in the colony, there were also Common and Arctic mixed in with this small group in the picture below. There are gulls like this Black Headed Gull breeding on the island (they are much more easier to get flight shots of than the terns). I met some one called Kathy James whilst watching the Tern Colony; accompanied by Ken Croft (both from Nature Bites). Kathy was the person invited by Peter (my ringing teacher) to do a ringing roost session. They both gave me lots of help so I would like to say a big thank you. Whilst I was at my Grandma's I also visited South Stack on the same day I visited the Tern colony, however the cliffs were no where near as full as the were last year. And I only saw one Puffin!!! Before I went to the Tern Colony I went to a small sandy beach right next to the colony which let me get a few snaps of a pair of Oyster Catchers. This remarkable bird is my dads favorite. And finally I wanted to share this picture of a Black Headed Gull coming in to land. Thanks for reading.. Stay tuned for my next blog. The day after I had my ringing session I went for a local walk with my family down by my local patch on the River Weaver and saw quite a bit of wildlife... Could anyone identify this butterfly for me? There are quite a few finches down by the river so I decided to photograph a fairly common finch species the Goldfinch. They are truly wonderful birds. This is the first Common Blue butterfly I have ever seen so it was rather nice to see. On the other side of the footpath there is a huge meadow and among those hundreds of flowers I spotted another Common Blue butterfly. Isn't nature just full of surprises? Another species of insect that I saw was the Damsel Fly, these are smaller than dragon flies and are generally Blue. We were followed all the way on our walk by this huge Buzzard. I also got a glimpse of Chunky for the first time in ages, so it was a relief to see him. 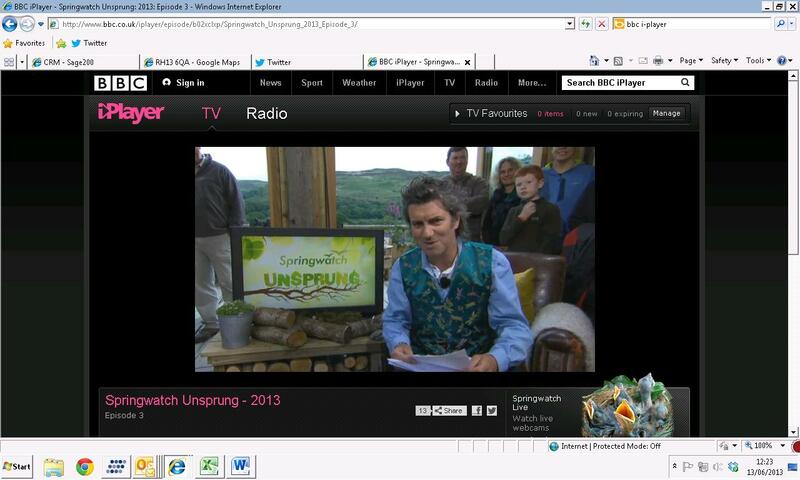 Only half an hour to go before I set off to have one of the most amazing experiences of my life, being on Springwatch Unsprung I was thinking to my self as I was coming out of school. Exciting and nervous thoughts were wedged in my head as I stepped into the car. As we set off on the 3 hour drive to Wales, I sat patiently enjoying all the wonderful scenery and thinking about what was to come. I was quite surprised when I first examined the reserve, as I thought it was just going to be hides by an estuary. It was actually much, much more; there were shallow pools and scrapes which attracted loads of different species of wildlife, for example, I saw water vole, Redshank, Reed Bunting in reeds, Redstart and much much more. As I was watching the Redstart I heard a sound that sounded like an engine. I turned around and then coming this way was the Springwatch film crew; I was thinking they must being doing a dress rehearsal. My dad asked if we could stay and take some pictures of the filming equipment; the crew said yeah but they also said if you hang around for a bit the presenters will be here. And so a few minutes later Chris Packham walked up to me and asked if I'd seen anything interesting - I was shocked! 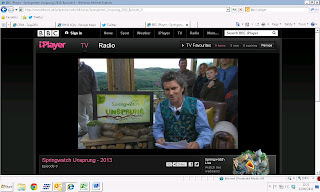 A few seconds after Martin came along and asked the same thing ( I told him we were one of there Unsprung guests). We had a chat about lots of bird stuff. Here are Chris and Martin rehearsing for the actual main show . As we made our way back to the reception we noticed the film crew were now filming Michaela, so me and dad just had to get some photos. It was like doing the actual live program with them...!!! It just gets better, a few minutes later Michaela went and joined Martin and Chris so me and my dad decided to watch them for a bit (it was great!). The minutes passed and then ACTION!!! we were all shouted in to the studio, the music began, the talking began and I was on TV!!!!!!! (I only know this because when the back of the camera faced me I saw what they were filming). After the Program I had chance to meat the presenters and get all there autographs including Nick Bakers. Here is me and Michaela. Here is me and Chris. I chatted to him for quite a while (about 10 minutes) all about birds and wildlife. But the kindest thing Chris did for me was give me the Badger skull shown on the program. He is such a knowledgeable man and so I'm giving him a big thank you. Here is me (with the badger skull) and Nick Baker. I also really liked meeting Martin and talked to him about my ringing with Peter Fearon. I want to say a big thank you to all the presenters for letting me have their autographs and for letting me ask them lots of questions. If you didn't watch it last night, you can watch it on BBC Iplayer for the next few days. It was also brilliant to meet Monty who is about the same age as me and takes brilliant photographs. I am going to stay friends with him. Spring has been a bit strange and very cold this year, but do you know what is this years estimated total number of feathery Spring arrivals and can you name the top four? I wont be posting the answer until Thursday as I am going to watch Springwatch Unsprung live tomorrow night, which is just a little bit exciting. According to the BTO "the estimated total of Spring arrivals is 16 million birds, with Willow Warbler as the most numerous, followed by Chiffchaff, Blackcap and Whitethroat. Whilst I was at my Grandma's at half term, I saw quite an interesting collection of birds, from Flycatchers to Sandwich Terns. But the bird I was surprised to see the most was the Wood Warbler; these active birds breed in my Grandma's and Grandpa's wood every year, however my Grandpa was rather concerned they hadn't turned up this year until I spotted one on Friday, the last day of visiting my Grandma's. I have to say my Grandma's wood really does inspire with all it's wildlife (including all it's lovely flowers, like Blue Bells). It wasn't just Warblers, Flycatchers and Terns that I really enjoyed watching; all there garden birds like Chaffinches (below) gave me a good chance to practice my photography. I hope you like my pictures (Greenfinch below). I will soon be back with another post all about Cemlyn Bay and the big tern colony that lives there. Hello, I'm back from an incredible time at my grandma's... As soon as I arrived I was up the wood (with my new lens for my camera) taking pictures of this extraordinary male Pied Flycatcher. It wasn't just the Pied Flycatcher that caught my attention, another extrordinary bird I saw was a male Redstart that flew out of my view finder as soon as I held the camera up to my eyes. (Later in my next posts I will be sharing with you my experience with a male Wood Warbler). Here he is, the male Pied Flycatcher just about to hop into the nest box with a beak full of grubs, so he can feed the the female that was incubating eggs (sadly I didn't get a picture of the female Pied Flycatcher but I did see her). Here he is once more about to fly to the nest box. These are my best photos, but not quite as good as the picture I have of it in my head.